Every community has something unique to call its own. Ludington has its carferry, but now it has something artistic to share--The Mason County Sculpture Trail. This one-of-a-kind trail was launched in 2012 and includes the nine sculptures at Waterfront Park, sculptures at both the Ludington Library and the Mason County Fairgrounds, at the Ludington State Park, Maritime Heritage Park on Ludington's Lake Michigan shoreline walkway, Mason County Sheriff's Office, Stearns Park and the village of Fountain. A new sculpture is in the works for the green near the Scottville Clown Band Shell. "Forward March" will be designed by Harold Cronk, and will feature the Clown Band and Scottville's agricultural history. The five-acre Waterfront Park between the two Ludington marinas is a beautiful place to picnic, watch the carferry, or listen to music at the amphitheater. Over the past dozen years, sculptures have been placed throughout the park, each one telling a story of Mason County's past. They depict the lumbering era, farming, fishing, carferry history, and a past baseball team. Each one is so unique and a wonderful addition to this spectacular park. Read more about the Waterfront Park sculptures in downtown Ludington. 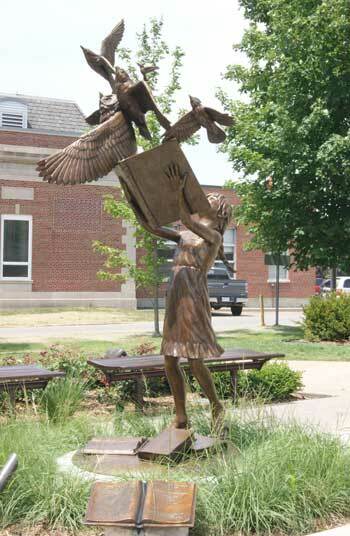 Right in downtown Ludington is the majestic Mason County District Library, and right in front you can't miss the "Flights of Learning" sculpture which was unveiled in June 2012. Children seem to flock to this sculpture, which is quite fitting, as learning from a young age is the prime focus of the library. The Keith Wilson Children's Center at the Library was added in 2012, complete with a Sailboat Play Area. Another sculpture, "Double the Fun," was dedicated in August 2014. You'll find it at the Craig R. Rasmussen Outdoor Activity Area at the Library. It was done by Stanley Proctor and given to the people of Mason County by Jon Ferguson in memory of his wife Sallie Peterson Ferguson. At the entrance to the Mason County Fairgrounds, US-10, Ludington, is the "Rearing Horse Memory Pole" sculpture. Also dedicated in 2012, this depicts the role that horses play at the fairgrounds...to the numerous horse shows throughout the summer and to the Caswell Horse Park within the fairgrounds. In 2013, the Ludington State Park received a sculpture across from the park office. "Community Cooperative" is a charming depiction of a community of animals living in an old tree. It celebrates the wildlife that is in abundance at the park and around Mason County plus the beauty of nature. This sculpture was sponsored by John J. Helstrom of Muskegon and the artist was Colette Pitcher of Greeley, Colorado. With the addition of this sculpture, the Mason County Cultural Economic Development Task Force hopes that people may come to the park that might not otherwise. And those at the Ludington State Park may venture out to view the other sculptures in Ludington. Two sculptures are located in the area along the channel between the Loomis Street boat launch and the Coast Guard Station, an area designated as the Ludington Maritime Heritage Park. "Sport Fishing" is sponsored by Carol Polston in memory of her late husband Barry, an avid fisherman. It was created by artist Bryce Pettit of Durango, Colorado, who also did "Flights of Learning" at the library. "The Abbey" was a Great Lakes Schooner, built in Ludington in the late 1800s. The double-masted vessel made excursions between Ludington and Chicago, and eventually sank off Portage Lake Pier. This sculpture was designed by Tyson Snow of Utah and sponsored by Jack and Shirley Rasmussen. "Helping Hands," was created by Colette Pitcher and donated by Dr. Terry and Sandy Luxford. This sculpture. erected on the grounds of the Mason County Sheriff's Office, pays tribute to the law enforcement personnel who have served the citizens of Mason County. 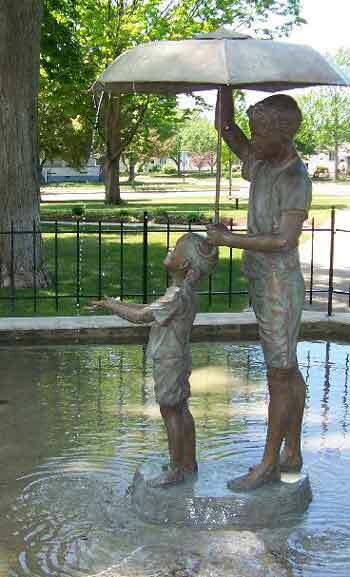 which features two children under an umbrella was also created by sculptor Tyson Snow. It is located in the central fountain area of Ludington Rotary Park in downtown Ludington, and was among improvements and upgrades to the park designed and coordinated by the Ludington Rotary Club through a donations campaign. The Village of Fountain has a sculpture at Heritage Park, depicting two horses pulling lumber. It was created by Rueban Llano of New Era, and is the first sculpture in the eastern part of the county. "Ascent of Heroism" is found at the Veterans Mall at Stearns Park, donated by the family of the late Milan S. Reed. It depicts a person from each of America's wars. Sculptor Paula Slater created this sculpture, along with a bust of William "Bill" Charette, also located at Veterans Mall. Charette served in the Navy during the Korean War and received the Medal of Honor for his heroic efforts. A new sculpture is in the works for the village of Custer. Set to be placed just south of Mason County Eastern Schools, this sculpture will pay tribute to Johnny's Bandstand. Several of the sculptures have scanner codes so people can use their smart phones to access information about each piece...making the journey on the Mason County Sculpture Trail that much more enjoyable. More sculptures are planned for the future in Ludington and surrounding communities.